"Impossible is just a big word thrown around by small men who find it easier to live in the world they've been given than to explore the power they have to change it"
Typically I hate tag-line advice, advice that makes the answer seem so simple. 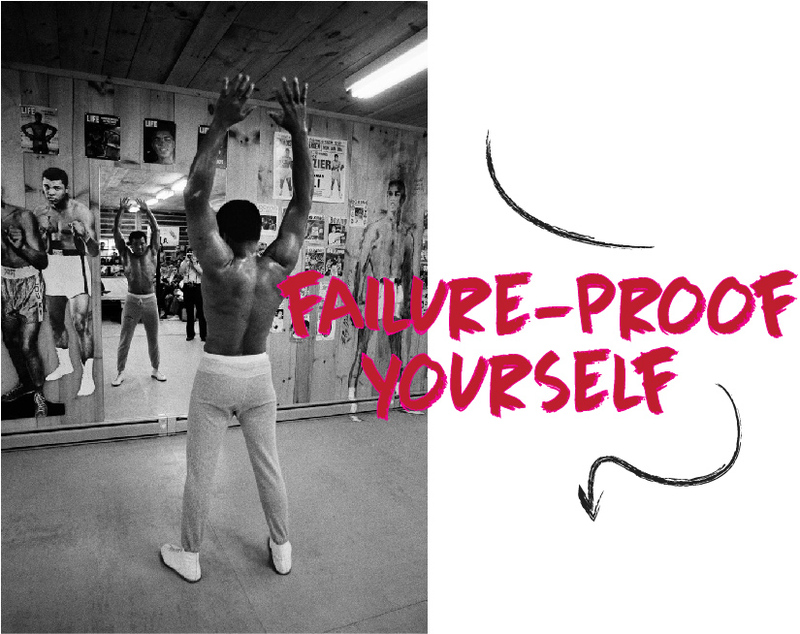 Failure proofing yourself is not simple. Getting back up after you have been knocked down is hard, sometimes it feels impossible. Muhammed Ali is a cultural icon. Some might say he was a hero. He knew how to throw a punch but he also knew how to take a punch. What made him a hero was his ability to get back up and keep fighting. Across his career he was stripped of his title in the war, he was banned from fighting, he lost in massive defeats to Frazier and then Norton (Frazier bore his jaw) and then in the ultimate blow he developed Parkinson’s disease. Each time he bounced back, most resolutely and beautifully when he carried the Olympic torch at the 1996 Atlanta games. Ben Horowitz is also an excellent fighter. I am not sure if he has ever set foot in a boxing ring, he fought his battles in Silicon Valley. His book “The Hard Thing About Hard Things” is an ode to getting back up again as he was dealt blow after blow in the business-ring. Our heroes are just ordinary people who make themselves extraordinary. Our heroes are ordinary people made great not by their successes but by the size of the blows they repeatedly endured in the ring. In the tech world we say that problems are opportunities in disguise. Are your wasting your life worrying about the roadblocks and brick walls rather than seeing the opportunity which they present. In the face of the darkest moments, can you find the “not-yet”. Can you stop or slow down enough to bring perspective to your problem and to see your options. If you look at nothing but the problem then that’s all you will have; the problem. Failure is stopping, quitting, in the face of a problem. Resilience is finding the opportunity to grow and to be re-formed in the face of a loss. It is in the practice of resilience that heroes are born.